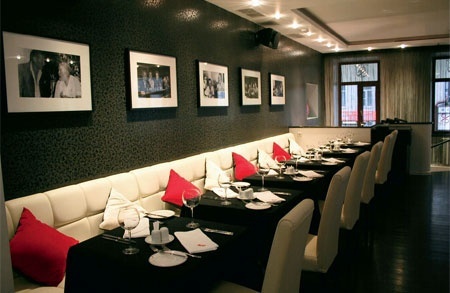 Floridita has been long in coming to the Old Arbat, now about three years since first announced. Current owners John Rose of the Rose Agency; David Wack, a partner at law firm Squires, Sanders & Dempsey; and Alexey Gurin, CEO of CentreInvest Group, happily greeted guests at Floridita’s early September grand opening. Cuban Ambassador Juan Valdés Figueroa and Andrew Macdonald, CEO of Havana Holdings, the company behind the Floridita restaurants, were distinguished guests. The three-story Moscow Floridita is located at the corner of Spasopeskovsky Pereulok, just across from Starbucks and a stone’s throw from the Hard Rock Café. The original Floridita earned the status of legend as Ernest Hemingway’s Havana hangout and as the birthplace of the daiquiri cocktail, created in the early 20th century by Floridita’s owner and bartender Constantino Ribalaigua Vert, “Constante” for short. As Cuba’s economy opened up, the Floridita brand was licensed out, first to London in 2004, then to Madrid, Dublin, and Leeds — and now Moscow. The Floridita line is that it provides a “unique opportunity to experience the exciting and vibrant essence of Cuba’s rich culture and passion” replete with hand-rolled Cuban cigars, Cuban music, and cocktails. 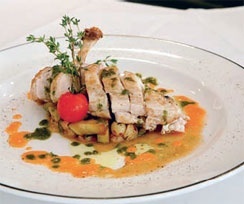 Fabrizio Crespi is the Moscow branch’s executive chef, responsible for the Cuban and Latin American menu. 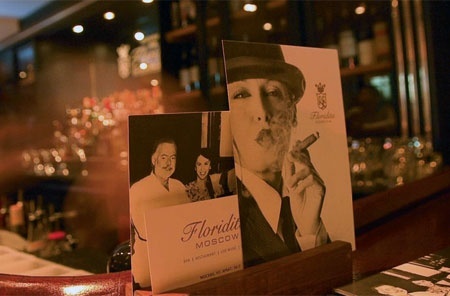 Floridita Moscow sports an overflowing sidewalk patio, a busy bar on the first floor, a small dining room on the second floor, and a cigar bar and the Constante Members Lounge in the basement. The walls throughout are graced with early photos of the denizens of the happy bar, including Papa himself. An energetic four-piece Cuban band entertains guests in the first-floor bar and terrace, which have a nice view of the crowds on the Old Arbat. For a cocktail, I made a quick start with the Hemingway Special (400r) made with Rum Añejo 3 Años, blended with fresh grapefruit, lime juice and maraschino. Other intriguing cocktails include the full and extensive selection of daiquiris and mojitos including the Bitter Orange Mojito (500r), and the Trotsky (400r). Though the Floridita wine list is somewhat thin, it does include a Joseph Phelps Sauvignon Blanc 2006 (3,350r), a splendid Baron de “L” Pouilly Fume 2005 (5,700r), a fulsome Aberfeldy Tim Adams Shiraz (4,750r), and an Opus One 2004 (26,580r). We dipped into the tapas menu: Sweet Tostones (plantain), Chili and Sea Salt (250r); Tortilla Patatas (190r), a Spanish potato omelette; Cured Chorizo Sausage (380r); Manchego Cheese with Rum Jelly (190r); Deep Fried Yucca (190r); and Salted Roast Spanish Almonds (200r). The ample chorizo was delicious; it, the Manchego, and the almonds disappeared quickly. For dinner, I selected the Avocado, Cactus and Orange Salad (small 380r/ large 580r), Sweet Potato and Pumpkin Soup with Garbanzo Beans and Chicken Dumplings (450r), and Free-Range Chicken Breast, Sautéed Courgettes and Raisins with Tomato Dressing (680r). 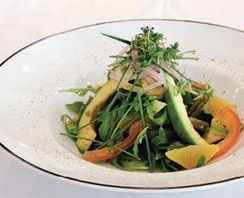 The avocado was perfectly ripe and the salad large and not overdressed, tasty and sweet, the chicken fresh and tender, vegetables lightly cooked preserving their flavor. After dinner, we found our way to the Constante Members Lounge for a chance to try Floridita’s aged and fresh handmade imported Cuban cigars. The selection ranges from San Cristobal de la Habana El Principe (325r) and Diplomaticos No. 5 (285r) to Cohiba Linea Clasica Double Coronas (1,758r). 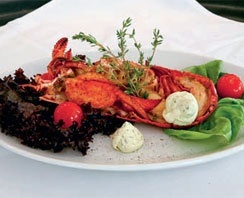 The service at Floridita was excellent and attentive, an impression reinforced by subsequent reports from other diners. The food was well presented and tasty, but fell short of raves. 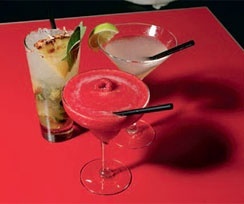 Guests commented that Floridita needs to work on perfecting its cocktails. The location is great, and the patio and first-floor bar seem to have attracted a Cuban and Latin crowd, good enough recommendation for a return visit.